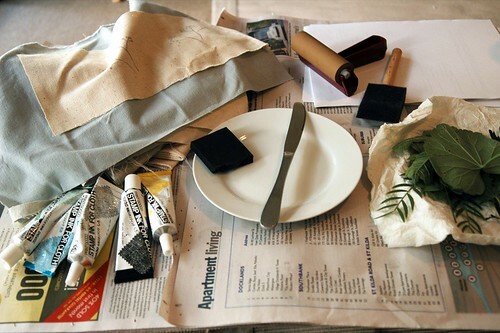 what you need: fabric paint, plate and a knife to mix colours should you desire to do so, cotton or linen fabric, roller, sponge brush, newspaper, scrap paper and, of course, leaves. 2. 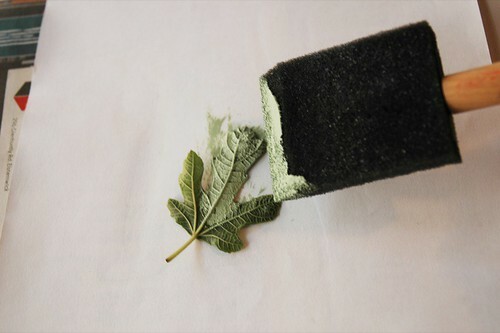 Place the leaf with veiniest side up on a scrap piece of paper and, using your sponge brush, dab it with paint until evenly coated (not too thick though). 3. Now place the leaf, paint side down, onto the fabric. 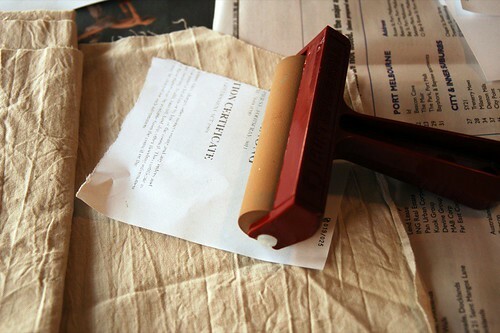 Cover with a piece of scrap paper to avoid getting paint on your roller, hold the paper down and roller over top of it, using even pressure. 4. Remove the piece of paper, peel back your leaf and there you have it! 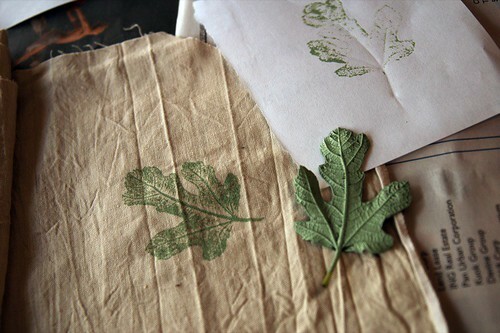 i'd love to see what other people do with this technique, drop me a note if you do some leaf printing of your own! • i use gocco stamp paint 'cause that's what i have on hand and it works great but i'm sure any fabric paint would be fine. 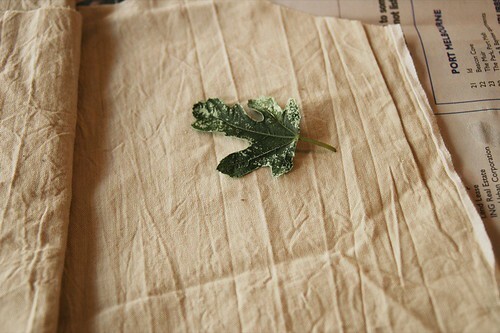 • if you find leaves but don't want to print right away, wrap them in damp paper towel, pop them in a plastic bag and stick them in the fridge. the fig leaf i used here was in the fridge for a week before i got around to using it! Thanks honey, I've always wanted to see how that's done. Gotta go, have to find some leaves. Thanks for showing us how it's done. Great pictures. Hey Les, this looks super fun!!! I wish I could send you some of the leaves from our neighborhood to use - so many nice, big ones!! Fantastic! I must try this. Thankyou. that is a great tutorial. I promised someone I would do a relief print tutorial. I have taken the photos..just haven't posted it.You have given me a push along, thanks. Hi Les! Could you send me your email address; it's been ages and I'd really like to swap updates/information. We're all fine (except that you Oz people are stealing our summer)and hope all is well with you too. Oh, this is so simple but really effective! I will so be trying this out over the weekend. Thanks for sharing! Thanks very much for your clear and well documented procedure. I want to try this on some walls. Could be tricky on the vertical...but I'm excited to try. Thanks! Glad to see other folks use this technique as well. I enjoy printing on paper and making cards out of it. When the paint is still wet, you can sprinkle some very fine clear glitter on it. It makes it look very finished and professional! Thanks so much for that...I will be off for supplies! Great idea, i have linked to this tute in my blog today - nice work! Lovely project - thanks for the tutorial! Thanks! this is from a kinder teacher at 4:00 am getting ready for tomorrow leaf printing! Oh very nice, wonderful tutorial! this is so simple but really effective tips! 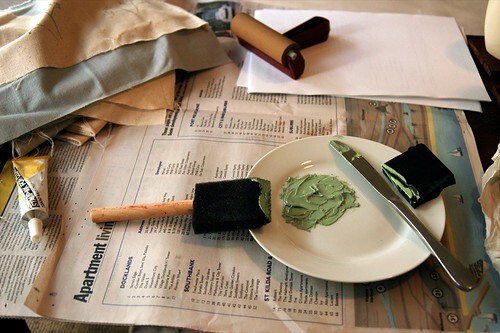 I will so be trying this for my printing. Pretty interesting site you've got here. Thanx for it. I like such themes and anything that is connected to them. I definitely want to read a bit more on that blog soon. Just found you through kootoyoo - thanks for the tutorial I love it, and will be trying it just as soon as I can go leaf hunting! Wonderful tutorial. I've been thinking about trying this for some time now. Thank you so much. Great !